Our Personalized Wedding Favor Sunglasses are a fashionable way to thank your friends and family for being part of your special day. Add them to a favor bag, present them on your event tables or just start handing them out - your guests will enjoy these sunglasses! Use the personalization tool to choose from a variety of colors and add your own text to create a fun keepsake of your celebration. The stylish glasses are white plastic with black lenses and offer 400UV protection. NOTE: Some assembly required, adhering personalized sticker onto 1 side of the glasses. The sunglasses measure 5.25" long x 1.75" wide. Can you order the frames in black vs white? Are these sized for adults? Yes for adults and these Personalized Wedding Favor Sunglasses measure 5.25" long x 1.75" wide. Can I have something written on both sides? Unfortunately, the personalization is only on one side. Do they come with a case of any kind? I'm sorry these Personalized Wedding Favor Sunglasses do not include a case. It will be packaged in bulk. How long before the wedding should we order? My wedding is 2/16/19 I would maybe need 160 done. Thank you! It takes 2 weeks for the process and shipping but you can order it now while stocks are still available. It says some assembly required. What exactly does that mean? For the sunglasses I want to include only one text line, but with 21 characters and not have the middle dot or second text line. Is this possible? Yes, you have an option to just put 1 text line on these Personalized Wedding Favor Sunglasses but the text line1 has a requirement of 20 characters, you can exceed to that limit. I want to have just one word with 21 characters in it and not have the 2nd word. Is there a way to do this? So no need for the dot in between either. I'm sorry, we are unable to change the template from what is provided on our site for any of our personalized items. The dot is also part of the template that will always be printed regardless if you're entering text on both sides of it or not. What's the max number of letters per line of the sunglasses? You can add 2 text lines on these Personalized Wedding Favor Sunglasses. Text line 1 is maximum of 20 characters and line 2 is maximum of 10 characters. Hi! Are we able to order the sunglasses with multiple text colors? You can only select one color per order. If you want to have different font colors, you need to do separate orders. Add another item with different personalization in your shopping cart before checking out so your items will be shipped at the same time and you'll be charged less shipping fee. How do the lines appear for these personalized wedding sunglasses? Are they side by side or on top of each other? Hi can I personalize my order to be in 3 different orders in 1 order? If I order 40 sunglasses, can I personalize 10 one way, 20 another, and 10 another? 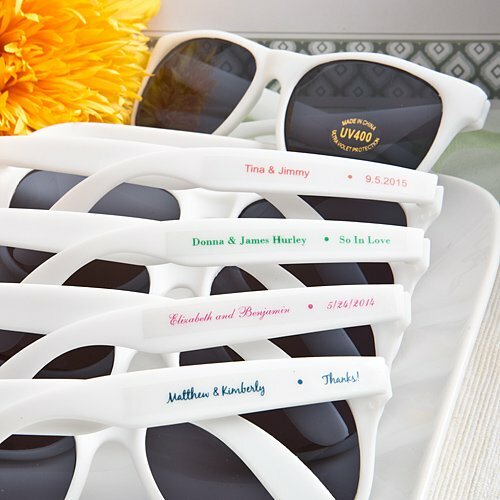 You can only select one color per order with this Personalized Wedding Favor Sunglasses. You may need to do separate orders if you want different colors. I would like to order the minimum of 40 but using 2 font colors-- is that possible? Unfortunately, you can only choose one font color per order. You can add a separate second order for a different font color before checking out to pay only one shipping fee. I want to buy the personalized sunglasses but I wanted to know if the stickers were still coming separately or will you engrave the words on the glasses? The Personalized Wedding Favor Sunglasses is a sticker and some assembly is required, adhering the personalized sticker onto 1 side of the glasses. I am looking at the personalized wedding favor sunglasses... Can you tell me if they only come in white?